Many front-end developers shy away from Webpack, much less tackle it head-on. The nature of Webpack is as such, that it has too many configuration options and tinkering with it could break the application. So this article attempts to simplify major concepts in the building of a frontend project specifically with React. Sprinkled in the article are little tips to prepare for Webpack 4.0! A frontend application has multiple files, .js, .jsx, .png, .jpg, .css, .ttf. We cannot possibly take these bunch of files and dump it in the production web server. The performance load time and overheads will be ghastly. What we need is a single bundled file of js that holds the structure and logic of the components and application, a single file of CSS for styles, and HTML file to render the DOM and an assets folders for images and fonts. There have been many tools and task runners that have helped in the bundling process. But Webpack has emerged to be the one-stop solution for many React frontend developers. To get started off, we have to install webpack and webpack-cli. We also need a basic project to bundle up. For that we can create a new folder called, ‘react-webpack’. We need a package.json file in our project, that would later be required to define our start scripts. Change directory into the ‘my-app’ folder and run npm init. Create a index.js file that will serve as the entry point to the Webpack. In the index.js, we can add a simple console.log. 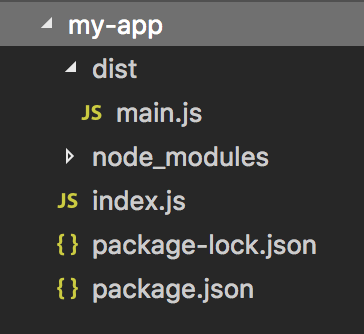 We can now use the webpack-cli to bundle this index.js into dist/bundle.js. But as the code base grows, it is impossible to keep using the ‘webpack-cli’ to bundle the code, for every change we make. 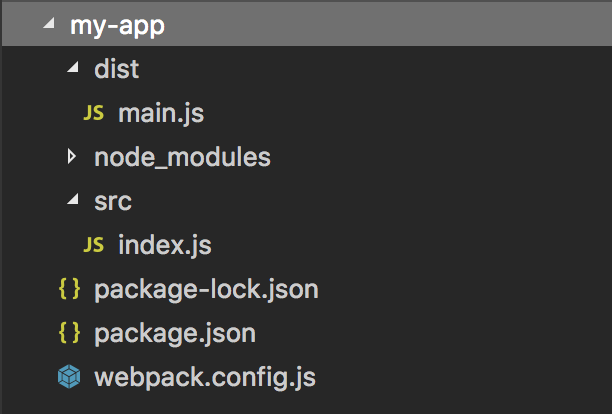 So what Webpack allows us to do, is to feed it a configuration object that consists of 5 important features. First up, we need to create a file for the configuration. In that file, ‘webpack’ library is required, along with declaration of the config object and finally to export this config object that will be fed to Webpack. Next, you guessed it right, we have to populate the configuration object. As a good practice, all the source files should be in a separate folder and not in the root folder. Specifying context tells Webpack to look for all source files, starting from ‘index.js’, hereon. This eliminates the need to add dots and slashes, using the relative path, to get to a specific file. To set this up, we require the ‘path’ library to help map out the absolute paths. Since we have set up the context or the base directory, the entry file can be stated as just ‘index.js’ instead of ‘./index.js’. This is where Webpack starts to chart its dependency graph. The output file is what the Webpack churns out at the end that contains the compact bundle of the whole application with the dependencies intact. This attribute is to tell Webpack which files and folders to look into when building its dependency graph. What this specifies is the Babel presets. A preset is a set of plugins that supports particular language features. For example, ‘react’ preset adds support for JSX and ‘es2015’ for ES6 features. This goes without saying, we need a development server to launch our application on the browser. Webpack provides us with its own dev server, webpack-dev-server. Installing webpack and webpack-cli to be saved within this project. All that needs to be done, is to add a devServer attribute to the above configuration. With this, we will have a simple dev server running that is serving files from the current directory. Now to be able to run the server, we need to tap in the package.json of the application. In the “scripts” attribute of the object, we add a command to run webpack-dev-server with hot attribute enabled. The hot attribute, allows the server to watch for changes in code. If there are any changes done, it will refresh the page automatically. And voila! We can see the application running on localhost:3000. This is as per Webpack 4.0 specifications as well. For the initial setup, you may look at this Github Repo for guidance. Up till this point, we have only scraped the surface of the Webpack. There’s still much to be explored. We are just getting to the exciting parts. The magic of Webpack lies in the ability to use loaders and plugins, which will be covered in Part II of this series.